This scroll contains one of the most finely executed series of illustrations to be found in decorated megillot. The highly accomplished, though unknown, artist has modeled detailed figures, scenes, and animals with delicate parallel and cross-hatched pen strokes. This creates an effect that is strikingly similar to the copperplate engravings of contemporary printed books. 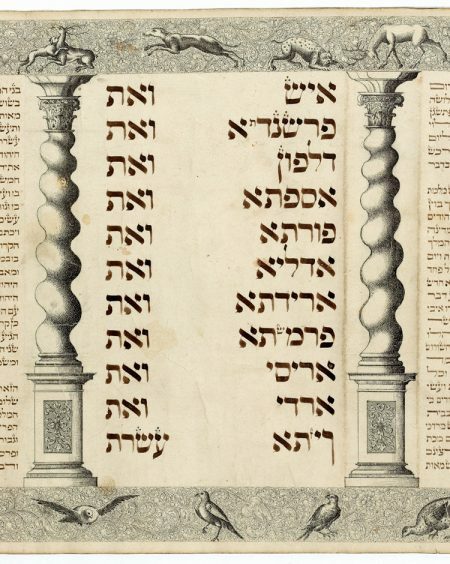 Artistic and historical evidence indicate that this megillah was most likely produced in Vienna in the first half of the eighteenth century. at the top and a similar one with birds at the bottom, are text columns interspersed with eight elegant full-length characters from the Esther story. The figures of Ahasuerus, Vashti, Mordecai, Esther, and Haman are joined by two messengers, and another depiction of Mordecai. 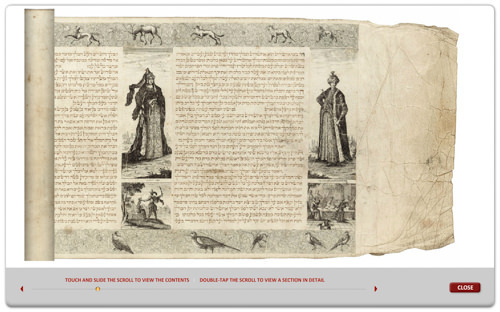 Below each of these figures is a small vignette that chronicles the Purim story. Scenes include the beheading of Vashti (cat. no. 82) and Haman weighing 10,000 pieces of silver as payment to the king for permission to annihilate the Jews. The decorative and stylistic techniques em- ployed in this scroll closely parallel those used by the foremost Jewish scribe-artists, for example, Aaron Herlingen and Meshullam Zimmel, who were active in Vienna during the first half of the eighteenth century. It is notable that the skillfully drawn figures that embellish this scroll are dressed in Ottoman-court clothing based on figures in a volume of costume engravings titled Die Neu-eröffnete Welt-Galleria (The Newly Opened World Gallery), printed in Nuremberg in 1703. The choice of Turkish dress is intriguing. One answer presents itself: the artist was aware of the Eastern locale of the Esther story and costumed the characters in appropriately “exotic” attire. As Turkerie was popular in the eighteenth century, it is also possible that in keeping with contemporary vogue, the artist or patron chose to have the characters in the Esther story depicted in Turkish dress. The use of costume of the Turkish court in a Western eighteenth-century Hebrew manuscript is, however, unusual. Perhaps the most cogent reason for the combination is that the scroll was produced for a member of the small, affluent community of Turkish Jews who, after 1718, were permitted to live and trade freely in Vienna, while still remaining subjects of the Sultan of Turkey.